Part of the trick of setting up SERCOM Ports is determining which pins go together. You can't just assign them Willy Nilly. The SparkFun graphical datasheets do a pretty good job of summarizing them. We are going to start by looking at the Redboard Turbo and checking its graphical datasheet as well as the SAMD21 datasheet. Click image for the full version. 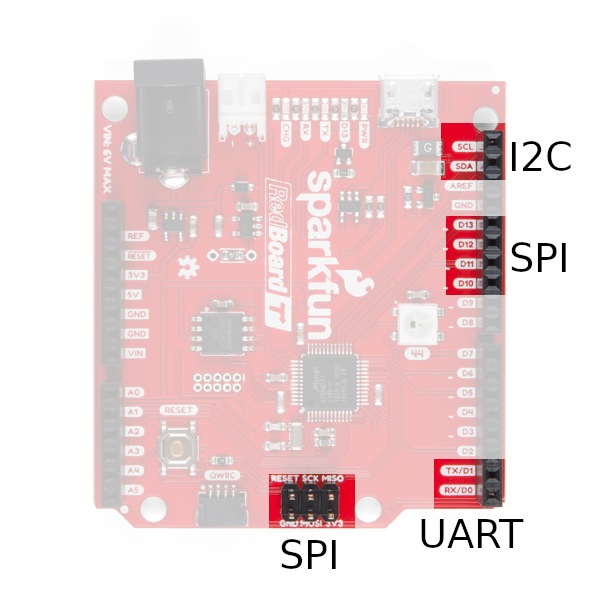 The SparkFun graphical datasheets are great at giving you a quick one page overview of the features of your board. Above you see a simplified version of the Graphical Datasheet for the Redboard Turbo. Click on it and you'll get a full size version complete with all the SERCOM ports listed. As you can see the Turbo has 1x Serial port, 1x I2C port (which is also connected to the Qwiic connector) and 2x SPI ports (D10, D11, D12, D13, and the legacy ISCP header). Looking at the SAMD21 datasheet (page 21) under I/O Multiplexing and Considerations, we can start to see all the options each pin can have. We can select any of the columns for each pin. Specifically, we are looking at columns C and D. Also, it is worth noting that the chip on the Redboard Turbo is the SAMD21G18. As you can see there are other SAMD21 chip variants that have more or less pins. The 'G' version is the one we want. As you can see, many of the pins have a 1 or 2 SERCOM ports available. Click image for the full datasheet. But What Pin Corresponds Where? While you can check the schematic/board file to see what pin on the chip goes where, the best option is probably the variant.cpp file for your board. Let's look at this file defined for the RedBoard Turbo. The file starts with a pretty large comment. While this is a good reference, keep in mind that people may choose not to update the comment for their board. Under the comment, you should see the Pin Descriptions. On the RedBoard Turbo, the pin definitions are broken out into sections to make it easier to read. The first section is D0-D13 staring with D0 and D1 which are the UART pins. You'll notice that the first arguments list the port and the pin on that port. The comment at the end also tells you what SERCOM port is being used. If we scroll through and find the pins that are using SERCOM pins, we'll find the following. Based on the code it looks like we are using SERCOM 0, 1, 3, 4, and 5. Any extra ports we use are going to have to use either SERCOM ports that are not already used or reuse one that is. Also, keep in mind that often unused ports are not removed. For example, this file lists D30 and D31 as an extra serial UART port. 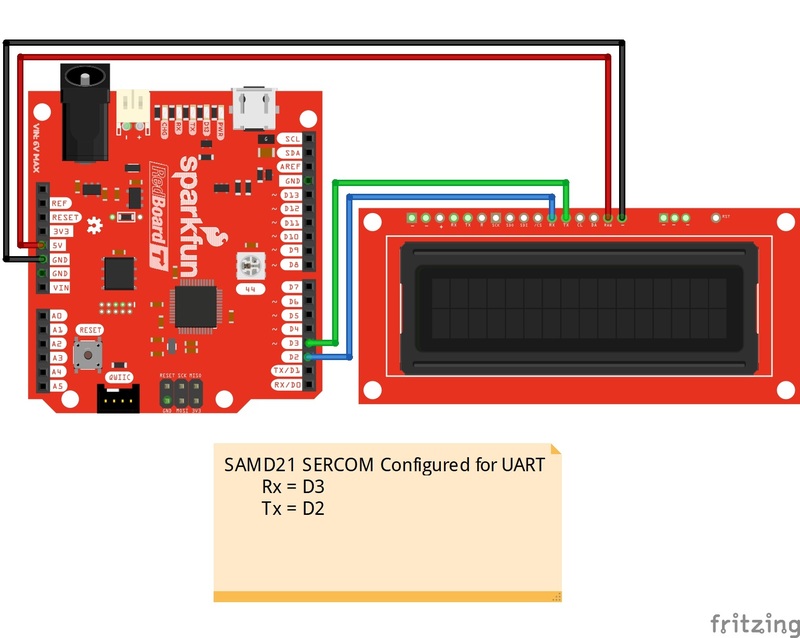 But, the board doesn't breakout D30 and D31 (but the SAMD21 development board did) so SERCOM 5 is actually free as well. We basically have 4x steps we are going to follow for each type of port we are going to add. The steps are the same for all types, but they are implemented a bit differently. Because the charts and datasheets are used for each type, they are listed at the end of the document. Make sure to have an extra window open when referencing the pins. 1.) Figure out which pins to use. 3.) Update the pin definitions based on the pin mux. 4.) Putting it all together. 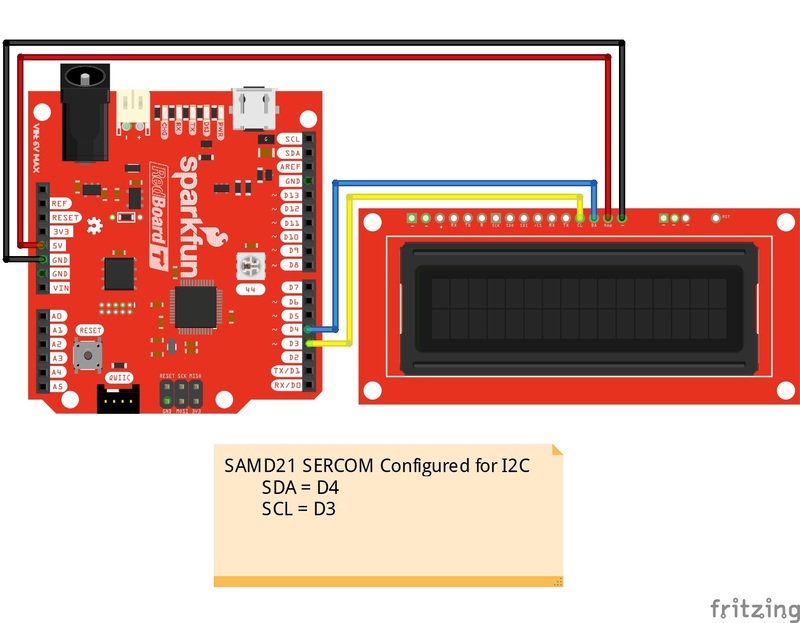 Let's start by checking out the SERCOM.h file in Arduino's SAMD21 core files. Specifically, we are looking at lines 73-86. You should see the code listed below. But what does it mean? There are 2 parts, the first part defines which pads you can use for an RX pad. It looks like you can use pads 0, 1, 2, and 3 which is all of them. Next, it defines which pads you can use for TX. It looks like you can only use pads 0 and 2. So, we'll need to keep that in mind when we select our pins. Since none of the boards I've come across use SERCOM 2 for anything, we're going to use it for our examples. Let's start with TX since those pins are limited compared to the RX. We'll need to find which pins are on 2:0 or 2:2. Looking at our charts, you can see those pins are labeled as MISO, D4, D2, and D1/TX. Since MISO and D1/TX are already being used, that means we can use D2 or D4. Let's use D2 and see if we can put our new serial port right next to the original one. That means that RX should be on D3. It looks like D3 is on 2:1 so that will work. Next, lets figure out what code we need. Let's take a look at the variant.cpp file again. Near the bottom, you'll see the following lines. This is what we are trying to duplicate in our code. The variant.h file defines all those macros, but their names give us a good idea of what should go there. Let's start with the definition. Let's pick a name. "mySerial" sounds good. We also know we are going to use SERCOM 2, that RX will be on D3, TX on D2, and that D3 uses pad 1, and D2 uses pad 2. So we'll add the following to our code. Next, we need to set up the mux. Right now, D2 and D3 are defined as general I/O pins. We want them to act as SERCOM pins. The first thing we need to do is to add the pin peripheral library. Then we use the pinPeripheral commands to set up the pin definition. You'll notice that one uses the argument PIO_SERCOM and the other PIO_SERCOM_ALT. If you look on the datasheet, you'll notice that pins can have a SERCOM port listed under SERCOM or SERCOM-ALT. For D2, we are using the SERCOM port in the SERCOM column. For D3, we are using the SERCOM port in the SERCOM-ALT column. Step 4 is running the code, testing, and troubleshooting. For this example, we are going to grab a serial LCD screen and connect it to our new serial UART port. Make sure that you have soldered headers to the LCD if you have not already. The next step is to test out the UART port with the code listed below. The code is pretty bare bones and shows you where all your new code should go. Copy and paste the code in your Arduino IDE. Select your board, COM port, and hit upload. * if you use this and we meet someday (Beefware license). 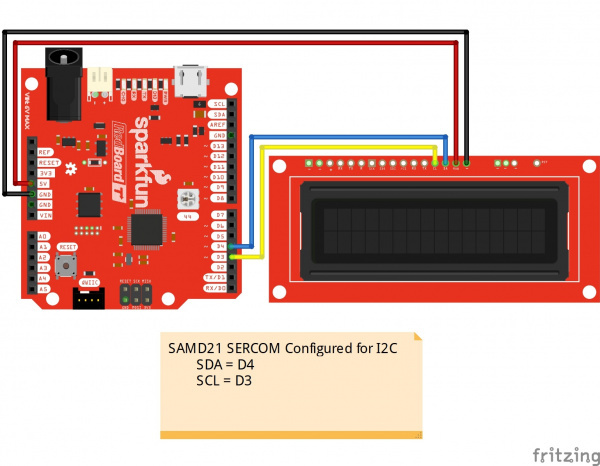 Let's start by checking out the SERCOM.h file in Arduino’s SAMD21 core files. Specifically we are looking at lines 73-79 (yep, we looked at those when we added the UART) and lines 102-108. You should see the code listed below. But what does it mean? There are 2 parts, the first part defines which pads you can use for an RX (MISO) pad. It looks like you can use pads 0, 1, 2, and 3 which is all of them. Next, it defines which pads you can use for TX (MOSI, and SCK) and in what configuration. So, we'll need to keep that in mind when we select our pins. Since none of the boards I've come across use SERCOM 2 for anything we're going to use it for our examples. Let's start with our outputs since those pins are limited compared to the MISO pins. It looks like SCK can only be on pad 1 or 3, and MOSI can be on 0, 2, or 3 depending on the configuration. So, looking at our table, let's start by removing the pins that are not broken out to our board or already in use. That removes MISO, D38, D1/TX, and D0/RX, leaving use with D4, D3, D2, and D5. Any of those look like good options, but lets go with D3 for MISO, D5 for SCK, and D4 for MOSI. Again, we'll need to dig into our fancy charts to figure out what is where. Next lets figure out what code we need. Let's take a look at the SPI.cpp file again. All the way near the bottom on line 261, you'll see the following line. This is what we are trying to duplicate in our code. The variant.h file defines all those macros, but their names give us a good idea of what should go there. Let's start with the definition. Let's pick a name. "SPI2" sounds good. We also know we are going to use SERCOM 2, that we are going to use D3 for MISO, D5 for SCK, and D4 for MOSI. So, we'll add the following to our code. Next, we need to set up the mux. Right now, the pins are defined as general I/O pins. We want them to act as SERCOM pins. The first thing we need to do is to add the pin peripheral library. Then we use the pinPeripheral command to set up the pin defintion. You'll notice that one uses the argument PIO_SEROM and the others PIO_SERCOM_ALT. If you look on the datasheet, you'll notice that pins can have a SERCOM port listed under SERCOM or SERCOM-ALT. For D5, we are using the SERCOM port in the SERCOM column. For D3 and D4, we are using the SERCOM port in the SERCOM-ALT column. Step 4 is running the code, testing, and troubleshooting. 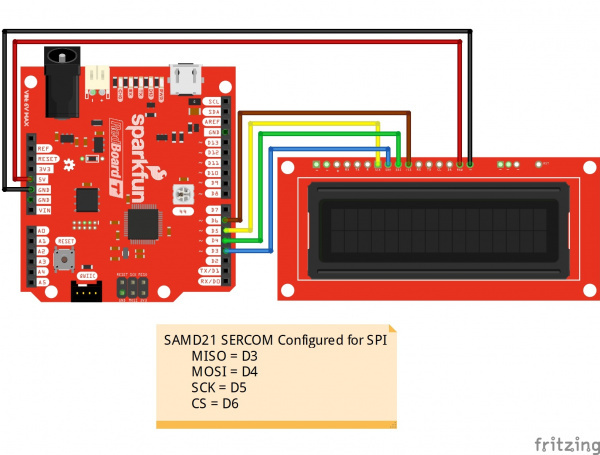 For this example, we are going to grab a Serial LCD screen and connect it to our new SPI port. Make sure that you have soldered headers to the LCD if you have not already. The next step is to test out the SPI port with the code listed below. The code is pretty bare bones and shows you where all your new code should go. The code also includes a pin definition for the CSPIN. Copy and paste the code in your Arduino IDE. Select your board, COM port, and hit upload. if you use this and we meet someday (Beefware license). //Reset the screen, set backlight, etc. Picking pins for I2C is a bit easier. SDA is always on Pad 0. SCL is always on Pad 1. That's it. In this case, when we look at our chart, we can immediately rule out MISO and D38 as those pins are used or not broken out. That means that D4 will be SDA and D3 will be SCL. Next, let&apos;s figure out what code we need. Let's take a look at the Wire.cpp file in Arduino’s SAMD21 core files. All the way near the bottom on line 285, you'll see the following line. This is what we are trying to duplicate in our code. The variant.h file defines all those macros, but their names give us a good idea of what should go there. Let's start with the definition. Let's pick a name. "myWire" sounds good. We also know we are going to use SERCOM 2, that we are going to use D4 for SDA and D3 for SCL. So, we'll add the following to our code. Next, we need to set up the mux. Right now the pins are defined as general I/O pins. We want them to act as SERCOM pins. The first thing we need to do is to add the pin peripheral library. Then we use the pinPeripheral command to set up the pin definition. You'll notice that the code uses the argument PIO_SERCOM_ALT. If you look on the datasheet, you'll notice that pins can have a SERCOM port listed under SERCOM or SERCOM-ALT. In this case, both pins are under the SERCOM_ALT column, but if you are using a pin under the SERCOM column, use the argument "PIO_SEROM". Step 4 is running the code, testing, and troubleshooting. For this example, we are going to grab a Serial LCD screen and connect it to our new I2C port. Make sure that you have soldered headers to the LCD if you have not already. The next step is to test out the I2C port with the code listed below. The code is pretty bare bones and shows you where all your new code should go. Copy and paste the code in your Arduino IDE. Select your board, COM port, and hit upload. I promised you some charts. Let's start with the SAM21 datasheet. Starting on page 21 under I/O Multiplexing and Considerations, you'll see all the pin definition including the mux options. This is really where everything comes from. Next are the graphical datasheets. While these are available on the product pages of any board that has one, here they are as a neat little collection. Note: The ISP header does not name the pins individually so it is referred to as ISP or the actual SPI pin names that are used on the board. Note: A comma means there are 2 pins that can use that port. A slash denotes 2 different names for the same pin. Note: Some pins are tied directly to the USB port or the Crystal and not available for use. They are labeled as such. I also figured it might be nice to know which SERCOM ports are open on different Arduino boards. Below is a table that lists what SERCOM ports that are already assigned to a serial protocol for a few development boards.